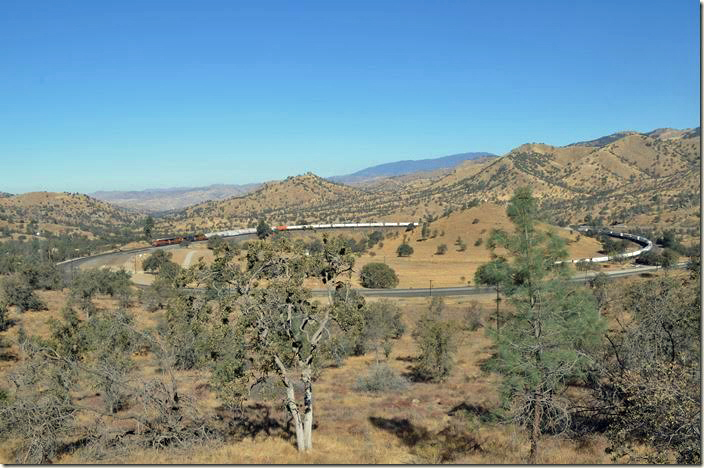 After visiting many wonderful sites in California – Death Valley, Yosemite, Kings Canyon, and Sequoia National Parks – Sue and I spent a few hours on the former Espee’s Tehachapi grade and loop between Bakersfield and Mohave. Frankly I didn’t do any homework on this other than note where it was on the highway map. I was pleasantly surprised when driving east on CA 58 that an exit led us to this historic site! I figured it would be more difficult to find! 1. After staying the night in Tulare CA, we encountered this westbound while driving south on CA 99. 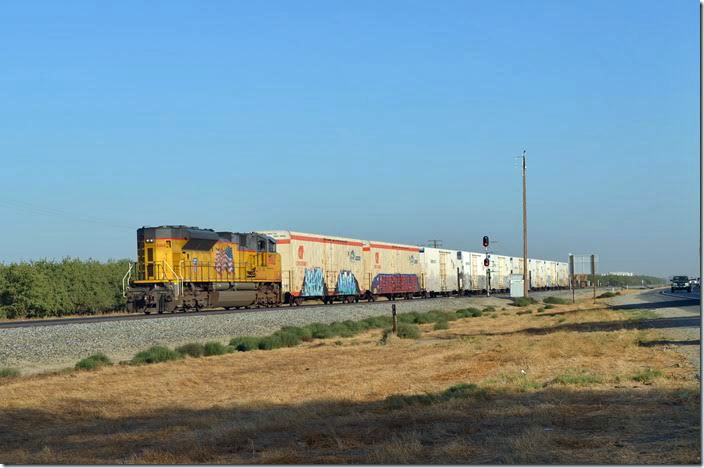 UP 2523-8478 has nine ARMN (UP/MP) and Cryo-Trans refrigerated reefers sailing by near Pixley CA. 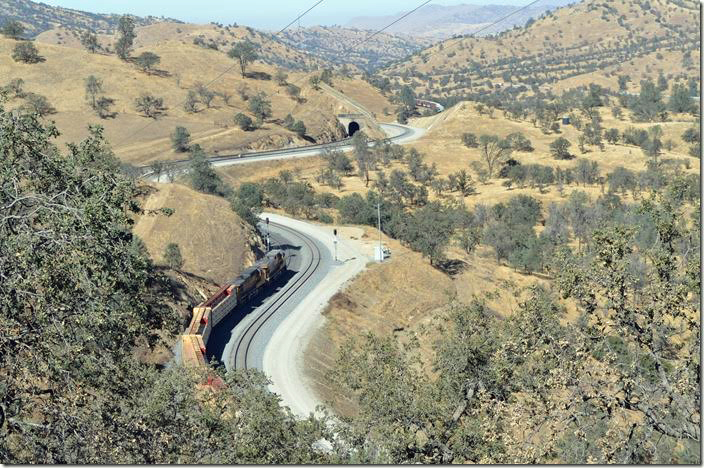 This is Union Pacific’s former Southern Pacific San Joaquin valley main line. 2. UP 2523-8478. View 2. Pixley CA. 3. Why in the world DP helper 8862 was needed is beyond me! San Joaquin valley agriculture was critical to Espee’s fortunes. Let’s hope this is not all that is left. UP 8862. Pixley CA. 4. J. D. Heiskell & Co. GP9 1886. Their facility near Pixley CA, produces animal feed. Heiskell is a large company and has many agriculture-related industries around the country. 5. 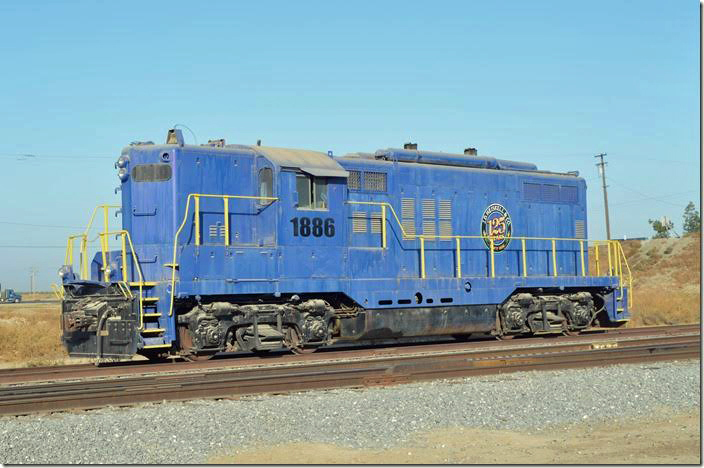 J. D. Heiskell & Co GP9 1886. Pixley CA. Neat logo. 6. Historical Marker Tehachapi Loop. Click image for larger view. 7. 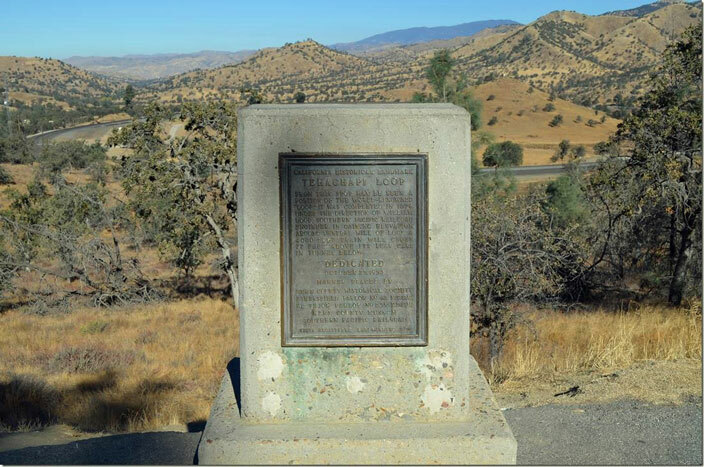 Historical Marker detail Tehachapi Loop. 8. 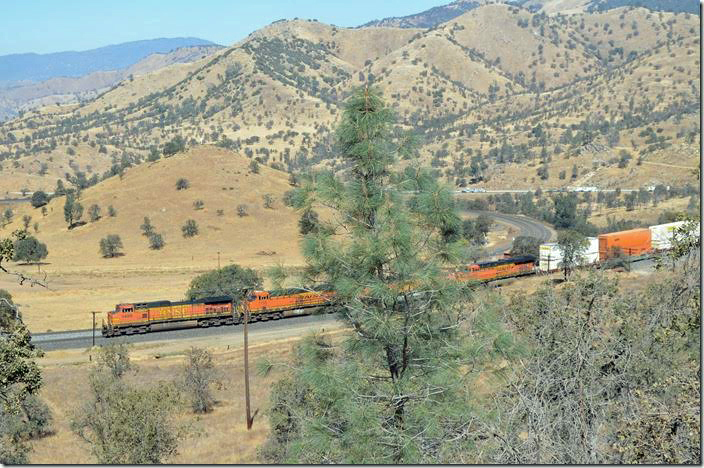 BNSF 7800-6746-CSX 596-3841 rounding the Tehachapi Loop at Walong with an eastbound. 9. The rear of his train has not gone through the tunnel yet. 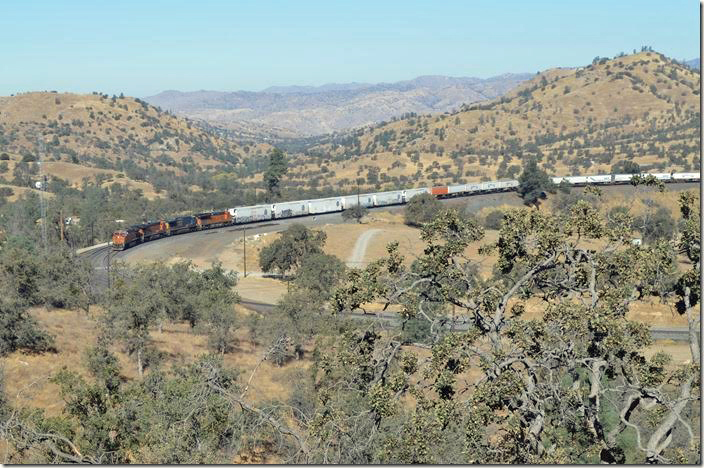 BNSF 7800. View 2. Walong. 10. BNSF 7800. View 3. Walong. 11. 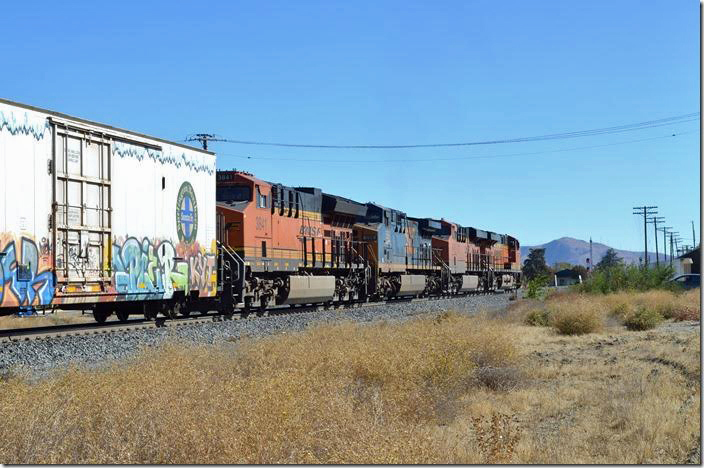 BNSF 7800-6746-596-3841. View 4. Walong. 12. 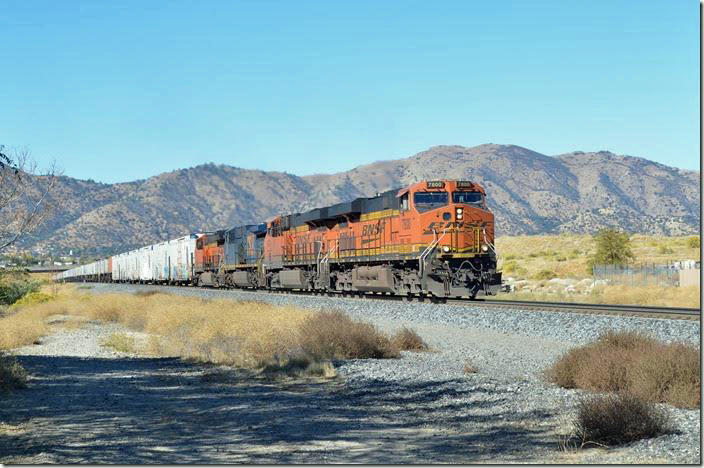 BNSF 7800. View 5. Walong. 13. 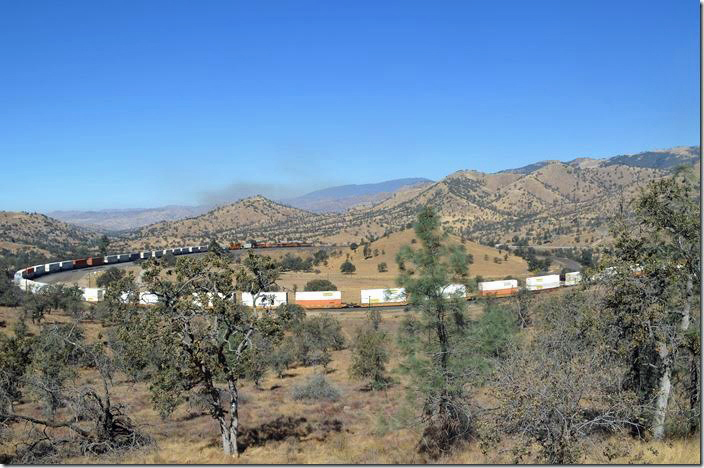 We beat 7800 up to Tehachapi which is about 8 miles. The grade lessens, but the summit is still another 2 miles east. 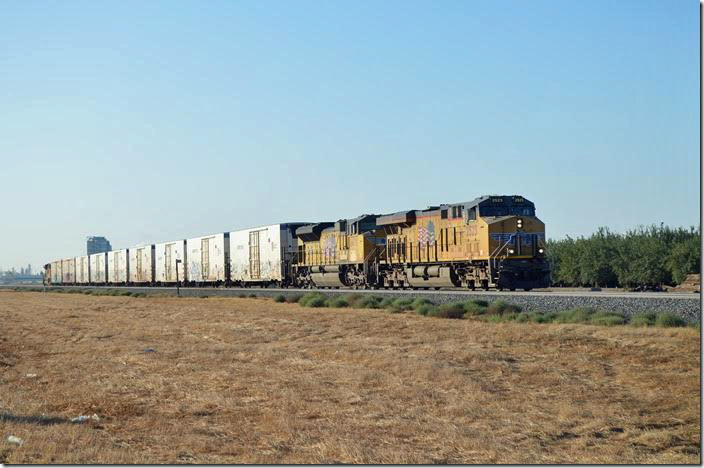 BNSF 7800-6746-596-3841. Tehachapi. 14. Clear signal. This is the location of the depot, etc. in the middle of town. 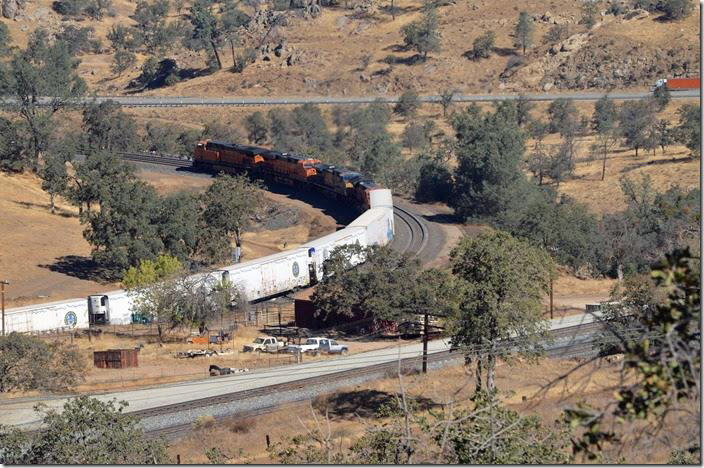 BNSF 7800-6746-596-3841. View 2. Tehachapi. 15. 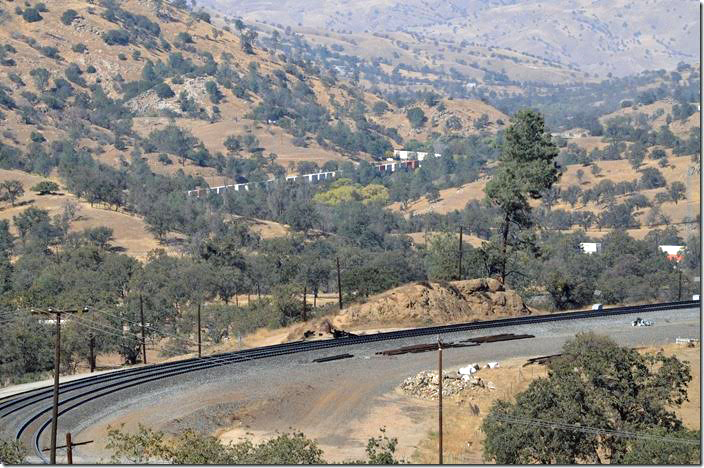 We head back over the hill and down Tehachapi-Woodford Road. 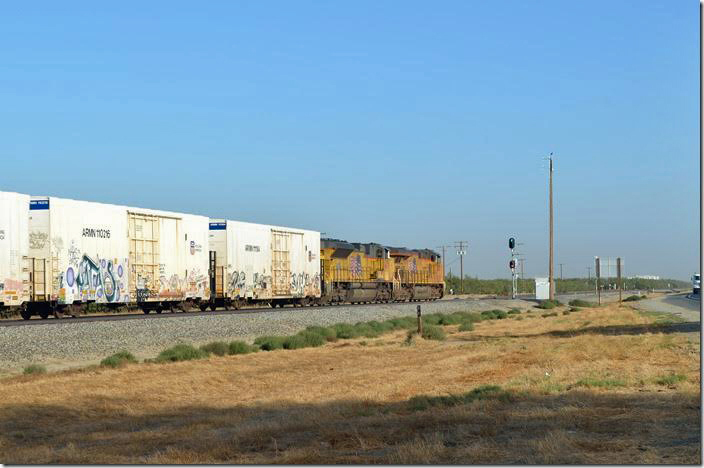 An eastbound UP freight was slowly moving upgrade with distributed power units 6678-7817 pushing. Tunnel 10. 16. 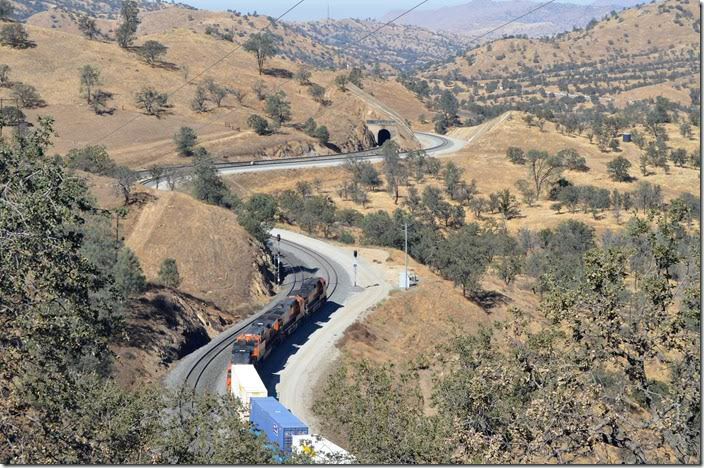 Westbound BNSF 5489 drops down grade at Tunnel 10. The recent construction by UP to the right of the tunnel enabled Walong and Marcel sidings to be connected. 17. BNSF 5489. Tunnel 10. View 2. 19. After BNSF 5489 passes the eastbound UP freight starts moving onto single track with 7817-6678 assisting. Near Tunnel 10. 20. BNSF 5489 descends the loop. Walong. 21. Notice the smoke beyond the distant hill behind the units. Cal Fire bombed the brush fire with Grumman Trackers and a 4-engine jet all day. BNSF 5489. View 2. Walong. 22. 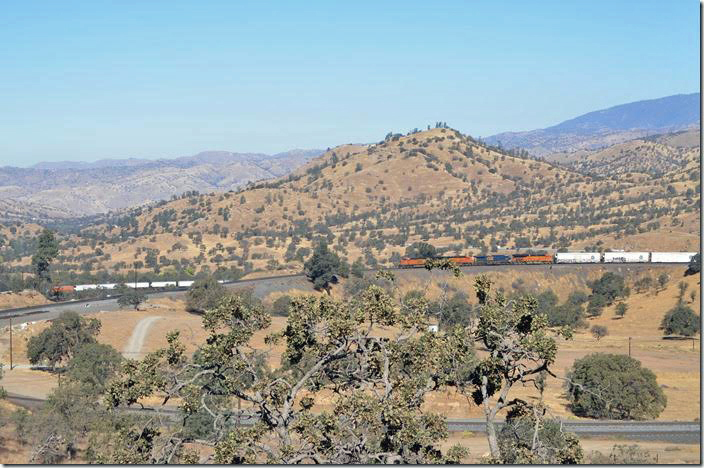 These views were all taken from the overlook on the Tehachapi-Woodford Rd. There are roads all over the place, but we didn’t have time to explore them. Take note; there are numerous “No Trespassing” signs. BNSF 5489. View 3. Walong. 23. 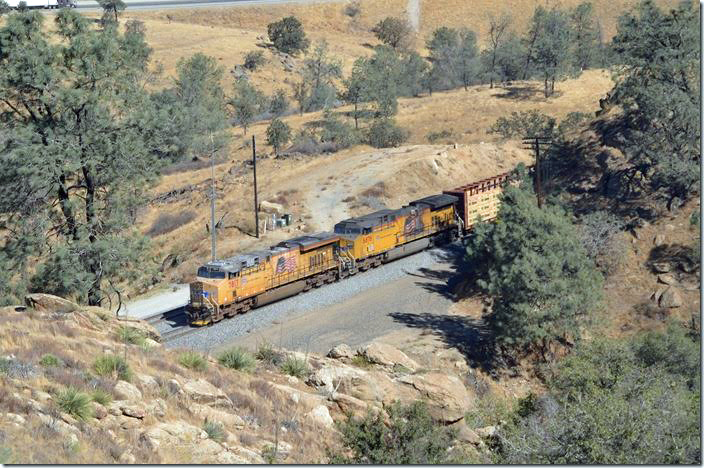 BNSF 5489 goes on down the canyon past Woodford siding. 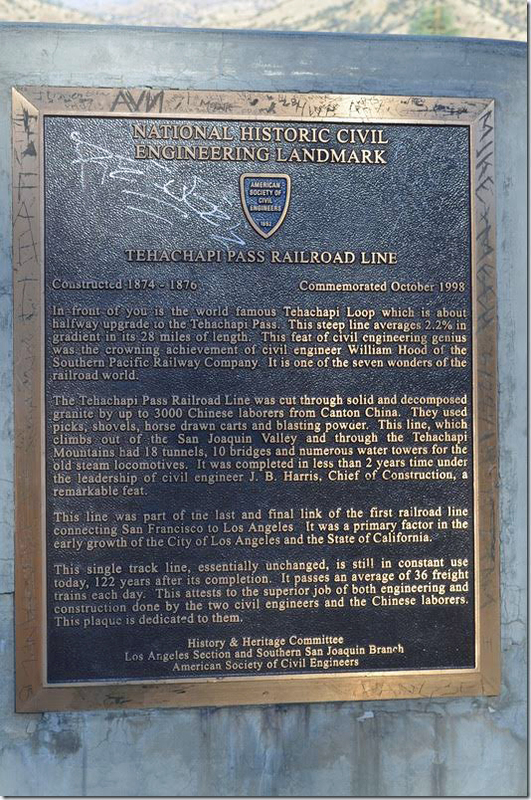 I’m not going to detail the operations or history of Tehachapi. The track belongs to Union Pacific formerly Southern Pacific. 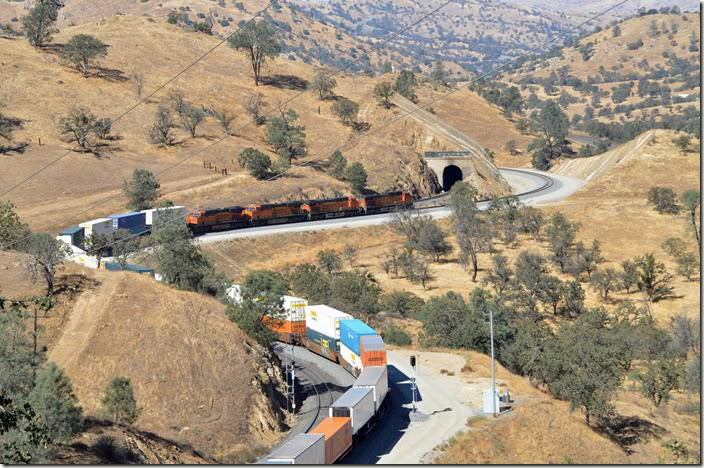 BNSF has trackage rights from Mohave to Bakersfield arranged by AT&SF. 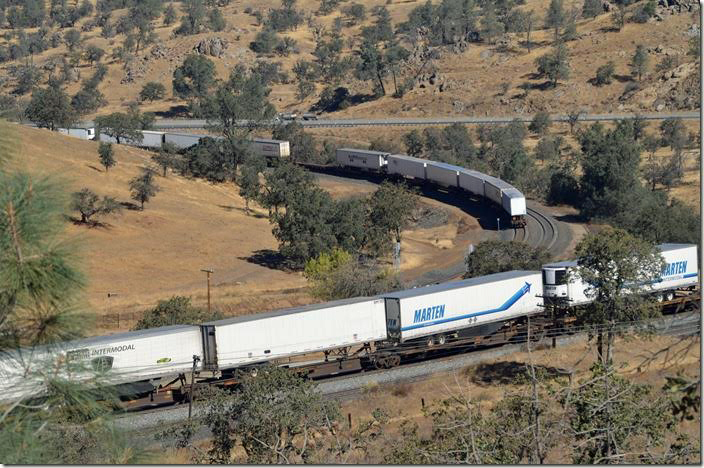 I read that the Mohave District here averages 40 trains a day. 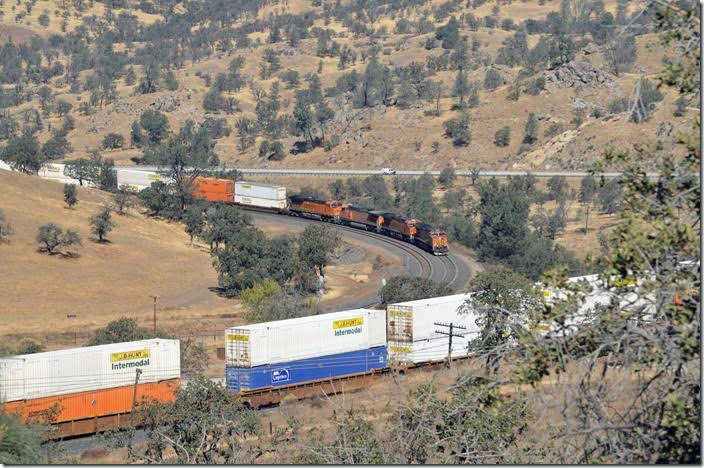 A retired SP engineer told me that tenant BNSF runs twice as many trains as UP. From what we saw, I would agree.